In the last post I shared a prayer I wrote for our children based upon John 17. With similar thoughts, I share with you today a letter I wrote to them in 2010. I can’t express the joy that I have from being your Mommy. I thank God daily for the little smiles, hugs, and laughter that you bring my way. I am blessed beyond. As your Mommy, God has commanded me to love, teach, and discipline you in a way that will make you desire to love God and obey His commands. The love is the easy part. Just looking at you makes Mommy want to melt and capture every moment in my heart. Teaching and disciplining you are the harder parts. God has made each of you unique with special gifts that He wants to use. Mommy has to try and figure out how to discipline and teach you in a way that molds you and doesn’t change who God made you. Don’t worry. God and Mommy talk about this a lot. He will help me. As you grow up, you will see that Mommy and Daddy don’t do things the way other parents do. You will not be allowed to do, watch, attend, buy, and listen to things that your friends do. It is because we love you. In the heat of the moment, you will call us “mean” and say that things aren’t fair. Thank you! That means that we are doing what God has asked us to do. About that fair word…Life isn’t fair. If I even begin to try and make it fair for each one of you then I am doing you a huge unjustice. See, the world is full of unfair advantages and disadvantages. So, things are purposely not going to be equal among you. Just because your sister or brother got to do it doesn’t mean you will be able to. Each of you are at a different level of maturity no matter what the calendar says. Mommy focuses on each of your personal needs and not about making it fair. You will do work around our home. We are a family and we all work together. There are times that you will even get dirty and sweat! Nothing a shower won’t cure. One of the greatest gifts that I can give you is a work ethic. It will take you far in life and bless so many people around you. Think it will cut into your playing time? Don’t worry. Some of my best memories are when I was a child working on the farm with my family. Great fun can be had when a family laughs together while working. Suddenly it doesn’t feel like work anymore. Mommy has very high expectations of you. I won’t accept anything but your best. If you give me half-rate work, I will make you do it again. Why? Because God expects our best. You are smart, talented, and able to love deeply. With God’s help, I want to mold you to use every ounce of gift God gave you. I am not going to explain everything to you. Sometimes it is just “Mommy says so.” I know that seems unfair but remember life is unfair. Also, God doesn’t give us answers to all of our questions. Sometimes we aren’t mature enough to handle the truth. Sometimes we wouldn’t understand even if He did tell us. But, we trust God to know what is best. Please trust Mommy to know what is best for you. When you make a mistake, Mommy will be here with open arms to welcome you but Mommy will not fix the mistake or get you out of the punishment. It is in correction that we learn. I will not steal an opportunity of learning from you. You should also know that I pray that on those times that you make a mistake that you get caught. I don’t want sin to ever build and make it appear easier. Just as God disciplines and punishes those He loves, Mommy will not withhold from you. But once forgiveness has been sought and the punishment has been paid, you will be welcomed with love. Sometimes you will receive grace. I pray that these times will help you understand what Jesus did for you. Church is very important to Mommy. This is where you will learn more about Jesus and have the accountability of others. Don’t just “go” to church; be a part of church. You will be blessed beyond with the fellowship of believers. Get to know the other kids around you and dive in to what God is doing. There is nothing on this earth more important to your Mommy than family. It is family that has gotten Mommy through the thick and thin. Because of this, I am going to help you build a relationship together so that you always have each other to fall on. We will eat meals together, work together, and play together so we learn about each others’ likes and dislikes. We will make memories – both good and bad. So many times the disasters are the funniest stories later on. Before Mommy knows it, you will be spreading your wings and taking off. Sometimes we talk about what you want to be when you grow up. Remember, Mommy doesn’t care as long as it is what God wants you to be. Because, when you are in God’s will then you are where you are supposed to be. I am preparing you for life so that you can be the best that you can be for God. As you mature, you will understand this. Until then, know that Mommy loves you “a whole lotta much.” Understand that Mommy is praying daily for you. Praying that you will make wise choices, be an example to others, and love God with all of your heart, soul, and mind. Click to read more about Our Story. Sarah – Thank you for your sweet, encouraging words. 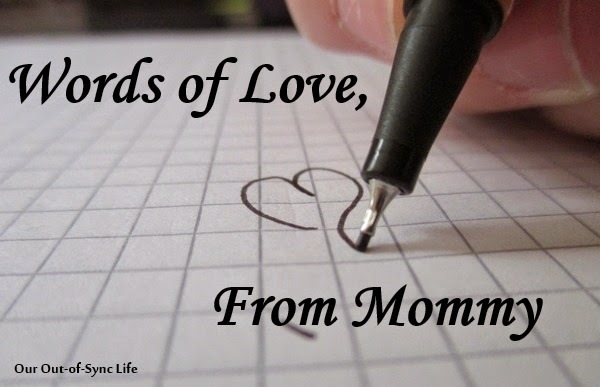 Praise God that we as moms can join together to raise our children to love the Lord! Sweet, sweet post. Your kids are blessed. I really love your blog! It is real and encouraging!